Ah, the collective knowledge of the internets. Interestingly, both groups have 27 people signed up. When a number of dummy particles meets an equal number of the same with opposite spin, does the universe collapse in on itself? Political parties should use online social networks like Facebook to rally support and get out their message. However, perhaps we’ll just leave this corner of Facebook alone while inhabitants of that space race America to declare “dominance”, name their children, and pick their champions. 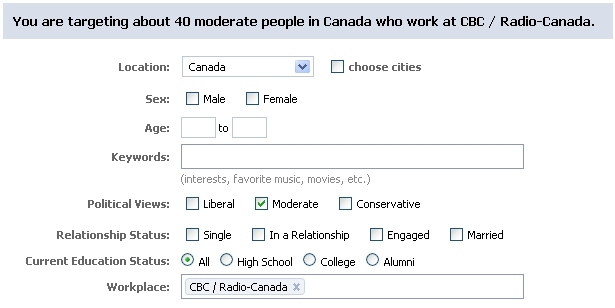 The CBC wrapped up their Facebook initiative on Canada Day. The Great Canadian Wish certainly provided some unintended consequences, yet it teaches us some truths about social media and its participants. Poor CBC! 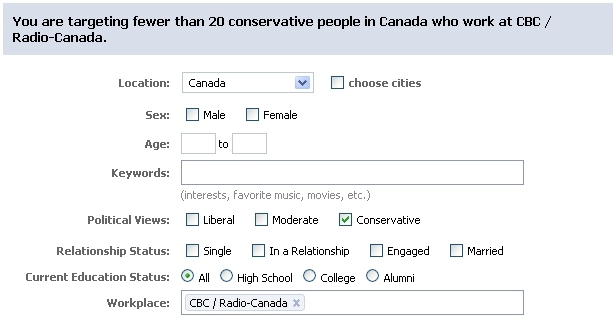 The only wish that would have made them cringe harder would have been if “Privatize the CBC” had beaten out the rest. The fate of the CBC isn’t as much of a divisive issue as that of abortion to be sure and that’s where we draw our first conclusion on why the public broadcaster got the results that it did. Polarizing issues will drive people to mobilize. Frankly, it’s been an effective tool used by the Liberals during the latest rounds of electoral combat. Going nuclear on the Conservative Party meant referencing abortion during the last desperate days of the writ period. Secondly, anti-abortion activists mobilized quickly and early. They also had the advantage of not representing the status quo; if abortions were illegal, you can bet that the pro-choice wish would have had more traction as it would have indicated a desire for change. The very concept of change is more mobilizing because it is natural to take the status quo for granted. Indeed, the issue of abortion is a real and emotional one for people on both sides of the debate. CBC also touched on a particular rationale for the presence of the the highly contentious issue: forum. 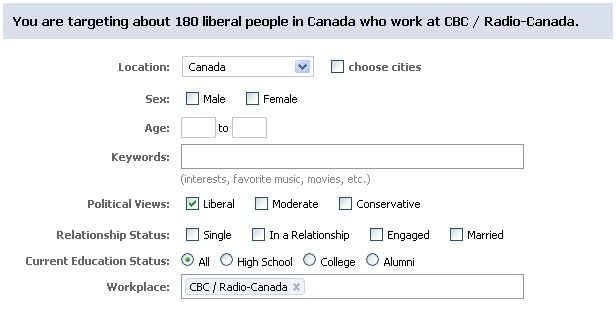 Since the topic of abortion has been one that hasn’t been polled or discussed in any real public sense for years (CBC illustrates this in its report above using Environics as an example), advocates against the practice felt that the Facebook group represented a “back-door” of sorts to bring it front-row-centre on a highly visible stage, the CBC. Are more Canadians on Facebook pro-life rather than pro-choice? Since reproductive choice / access to abortion is the norm in this country, the pro-choice advocates have had the advantage (and in this contest, the disadvantage) of arguing from a comfortable, mainstream position. The most significant motivating factor for pro-choice advocates only came into action when it became apparent that their pro-life foes might actually pull off an upset. The pro-lifers were primarily motivated by the issue, while the pro-choicers were too comforted and slowed by the mainstream acceptance of their position, and were only motivated when that position came under threat. Where the pro-lifers sought to act on the issue, the pro-choicers found their strength in reacting. Since acting comes before reacting, acting had a head-start. There are parallels, of course, to real life politicking that we can draw from the Facebook/CBC wish initiative. As, I’ve mentioned, emotional issues mobilize support and have been used by parties to get out the vote. The Liberal line was “we may have had some ethics problems in Quebec, but have you heard what the Conservatives want to do to your rights?” Since abortion isn’t actually an issue on the Conservative radar, Conservatives have difficulty appealing to emotion. “Rights” are compelling issues and the Conservatives would be wise to determine where they can successfully leverage their strengths in that domain (Rights for Afghani women and children is compelling). Status quo versus change is also a significant factor as the desire for latter can be a stronger motivator than protecting the former (for Conservatives and Canadians, economic freedom is a compelling right, however, it is the relative status quo). People take the status quo for granted and may only become motivated when a real threat is perceived. Often, these issues may come too late during an election for the reacting party. Certainly, the CBC experiment had some unintended consequences (I’m sure that they’re thanking their lucky stars that they didn’t commit to making this an 8-part mini-series starring George Strombolopolous), however, I feel that it highlighted some very interesting characteristics of human nature, politics, and evolving social media networks. 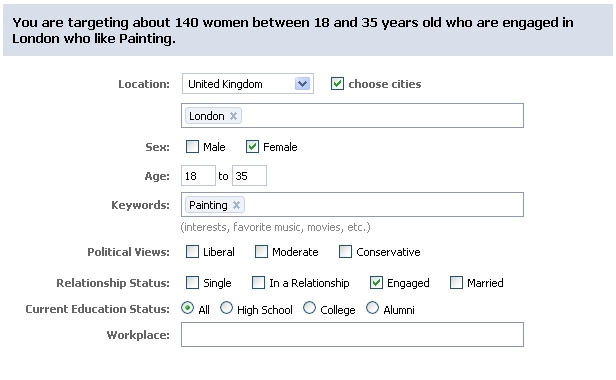 I wonder if other experiments that test human nature can be conceived and then realized on Facebook? UPDATE: Looks like the comments section has erupted into a pro-life vs. pro-choice debate. Consider that the post is actually about human behaviour as it relates to the motivating factors on social networks as a potential snapshot of the real-life world of political mobilization.